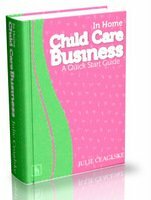 In Home Daycare - Why it may be the BEST Profession for YOU! Did you know that in home daycare is the most widely used form of child care in our country??? Parents are looking for people who will love and care for their children in a “family” atmosphere, because it is comforting for them. That is why starting a daycare in the comfort of your own home may be the perfect choice of a profession for you! Obviously you can work from home, and be able to care for your own children at the same time. You have your own business! You can become a professional… especially with childcare licensing. You can make a difference in the life of a child… and their family too. On top of these benefits there are Registration Benefits too. If you are planning on starting a daycare, know this: Parents love in home child care because many times they are able to keep their kids together during the day in a smaller, closer knit group. You can become their primary caregiver- year after year. They also love that they can get to know you more personally and have a level of trust that may be unmatched in a larger daycare center. They appreciate the love and acceptance you will give to their child, as well as the nurturing you provide and the nutritious meals and fun activities. You are in control – you make decisions (with the help of childcare licensing). In home child care lets you positively affect and guide the lives of children in more ways than you could ever imagine! Starting a daycare could be right for YOU! Go to the top of In Home Daycare.